A new G-Shock GWG-100 Mudmaster line has been revealed and it is already available in China as a December 2017 release. Models include the black GWG-100-1A, olive green GWG-100-1A3, and gray GWG-100-1A8. Like it’s big brother the GWG-1000 and unlike the GG-1000, the GWG-100 is equipped with Tough Solar power and Multi-Band 6 radio timekeeping. Unlike those other two Mudmaster lines the GWG-100 does not have any environmental sensors. Features include shock resistance, 200-meter water resistance, mud and dust resistance, world time, 1/100 second stopwatch, countdown timer, alarm, and full auto double LED Neon Illuminator and Super Illuminator light. All three models have silver buckles and resin strap keepers. The dimensions are 56.2 x 54.9 x 17.3 mm which is similar to the GG-1000 (56.2 x 55.3 x 17.3 mm) and smaller than the GWG-1000 (59.5 x 56.1 x 18 mm). 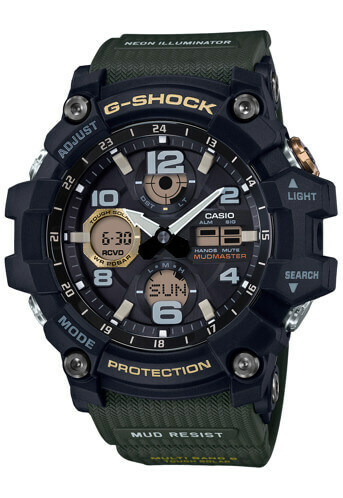 The GWG-100 Mudmaster looks to be a good option for those who want the tough look and ruggedness of the GWG-1000 but in a smaller and more affordable version, and prefer a solar and radio-powered model over the GG-1000 Mudmaster with Twin Sensor. A distinguishing feature of the GWG-100 is the full auto double LED light with both the Neon Illuminator for the hands and index and the Super Illuminator for the LCD displays, versus the standard double LED light of the GWG-1000 and the sole Super Illuminator of the GG-1000. The Neon Illuminator is essentially a “black light” LED that illuminates the analog hands and markings very clearly in the dark. 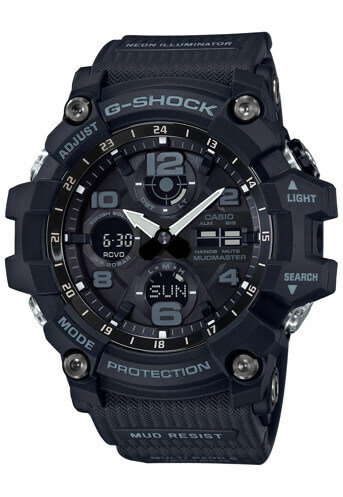 Features include shock resistance, 200-meter water resistance, mud and dust resistance, Neo Brite luminous hands and markers, Tough Solar, Multi-Band 6, world time (48 cities + UTC), 1/100 second stopwatch (60 minutes total with split), countdown timer (100 minutes), 5 alarms, battery level indicator, and full auto double LED light with Neon Illuminator and Super Illuminator. The GSG-100 series, which looks like the GWG-100 and has Tough Solar but no Multi-Band 6, will be released in some areas outside of Japan. Update: The GWG-100-1AJF, GWG-100-1A3JF, and GWG-100-1A8JF are scheduled for a February 2018 release in Japan with a list price of ￥45,000 JPY. Update 2: Europe is getting the GWG-100-1AER, GWG-100-1A3ER, and GWG-100-1A8ER while the rest of the world will get the GSG-100 Series with Tough Solar and no Multi-Band 6. Black bezel with gray lettering, black bands, black accents, reverse LCD display. Black bezel with gold lettering, olive green bands, gold accents, standard LCD display. Black bezel with gray lettering, gray bands, red accents, standard LCD display. The movement layout and functions makes me think its a derivative of the 5524 module used on the GST series and the GAW-100 series with only the display layout slightly different. I like the model as I had many viewers of my GG1000 video commenting how they would like a solar version of the GG but find the GWG-1000 way too expensive. This model seems to fall right in between.